Fall 2018 has brought a lot of interesting new vehicles to the market. One example is the 2019 Toyota 4Runner, the newest vehicle in a family of vehicles that have been impressing everyone since 1984. A vehicle that has lasted this long is still around for a reason, because year after year customers flock to dealerships to buy the newest edition. Its greatness is evident in its legacy. 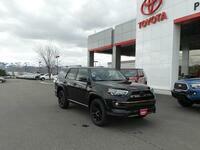 The 2019 Toyota 4Runner can be yours for the starting MSRP of $36,785. A small price to pay for a well-crafted vehicle, which has ample attention to detail. We are going to discuss those details right now, so stay with us to learn more about the 2019 Toyota 4Runner. The first thing we want to talk about is the exterior design. In the chart we mentioned just a few of the design features that make this vehicle a stunner. There are eight exterior colors, but also the 2019 Toyota 4Runner comes with color-keyed front and rear bumpers, heated power outside mirrors, roof rails, and 17-inch 6-spoke alloy wheels. Innovative technology features can make your life easier in a variety of ways. For example, the backup camera with projected path will help turn parking into a breeze. You’ll have no problem backing into a spot or parallel parking into a tight fit, and when you are ready to leave, the backup camera will allow you to reverse out of a spot with confidence. The projected path shows you an outline of where your vehicle will fit in the space behind you. You’ll never have to worry about forgetting your trash can is behind you again. Any potential customers interested in purchasing or learning more about the 2019 Toyota 4Runner should come to Phil Meador Toyota. We have a wide selection of Toyota vehicles and a sales team with expert knowledge of them.